In March, I turned down Farmer John’s generous offer of some of his rhubarb crowns to start some rhubarb in my own garden. “No thank you,” I said, thinking that rhubarb was so unpleasantly tart there was no way my family would ever benefit from having the stuff on our place. Silly me. What *was* I thinking? In defense, my only real memories of rhubarb include my maternal grandpa’s enthusiastic offering of a juicy red stalk freshly picked from his prized patch. My mouth still puckers up in shock just thinking about it! According to Farmer John, I was suffering from RDD–Rhubarb Deficiency Disease. 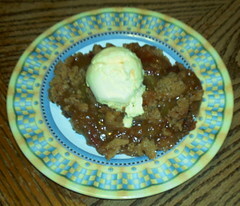 A very common problem with a simple enough remedy–a serving of Farmer John’s wife’s delicious rhubarb crisp! What a mind changer. Next spring, I’ll be the one doing the asking, er, begging–more like it! All five of us are now very big into rhubarb! Our palates just needed a little educating! 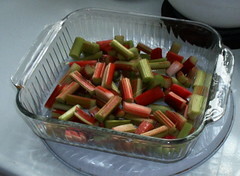 Place 4 cups cut-up fresh rhubarb in an 8″-square ungreased baking dish. Add 1/3 cup butter and mix thoroughly until mixture is crumbly. Bake 40-50 minutes or until topping is golden brown. This next recipe comes from the April/May issue of MaryJane’s Farm magazine. They have a great article on rhubarb. One of my new favorite magazines! Preheat oven to 375*F. In a large bowl, stir together first four ingredients. Add sugar, egg, and sour cream and beat well. Stir in rhubarb. Pour into a well-buttered 8″-square baking dish, or 8″ cast-iron skillet. With a fork, mix together sugar, cinnamon, and butter. Sprinkle mixture over top of cake. Bake for 35 minutes or until a toothpick inserted into the center of the cake comes out clean. The good news about planting rhubarb is that it is a perennial plant, so it will come back year after year…Farmer John has had his rhubarb patch for 25 years. He’s got a nifty raised bed method going on at his place–several rows of recycled, inverted tires filled with garden soil and large leafy rhubarbs! Nice, neat and handy! So, what are your thoughts about rhubarb? Does your palate need a little educating, too? HMMMM I wonder how hard it is to grow the stuff? Are the leaves poisenous? You have given me much to think about. Have a good night. Amy, that sounds yummy to me! I’m finding that rhubarb tastes good with many different fruits…apples weren’t coming to mind until you shared this! Thanks! Jamie, the leaves are highly toxic, so yeah, be careful not to use the leaves, just the stalks. I don’t think it is hard at all to grow, judging from what Farmer John has shared. Especially since it comes back each year. They fertilize it in the fall with chicken manure. Fun to see you here again! Have a great night yourself! I don’t know if I have ever had or even tried rhubarb, but those recipes sound absolutely delicious! We grin at your rhubarb conversion story, Mary. I think one or two generations have grown up without knowing much about rhubarb. Most comments I hear about rhubarb are prefaced with something about Grandpa or Grandma’s garden – so it’s been about three generations since rhubarb was standard fare on the dinner table. Like rhubarb, many folks have never tasted fresh foods from the garden and find comparison to supermarket fare an eye-opening experience. Things really do taste better when fresh picked or vine-ripened. Better for you, too. Oh my goodness, you didn’t like rhubarb, what about cranberries. They both are sort of the same taste shock but ooooh do I love both of them. As your farmer friend indicates it was a regular favorite in days gone by but I’ve had a rhubarb plant since moving to Cheyenne. I transplanted it so it’d get more sunshine and this is the second year after transplant and it’s startig to really grow. One year and I can’t remember the circumstances it grew to great height – at least 3ft and the leaves were wonderfully fall colors. I’m not sure if it got more water or less in this high desert climate. Strawberry rhubarb pie is ‘as they say’ to die for. I tried rhubarb pie once as a kid and didn’t care for it at all. There are lots of folks who got a first bad impression of taste on more than just rhubarb when they were kids. I know since I grew up (at least somewhat), I like things now that I never liked when I was young. Do taste buds change over time? Yes. Do attitudes change over time – yes, with some persuasive recipes like Mary’s. “Wow, this is really yummy . . . what is it?” This is the kind of comment we often get when a guest sits down at our table and consumes something they can’t immediately identify or something they think is something else. It happens with rhubarb desserts, lamb meat loaf, rabbit sandwiches, various cooked greens, and lots of other foods. I think getting people to try things without prejudicing them ahead of time by telling them what it is, is often a great way to introduce unfamiliar foods. When I grew up, we ate what we had. Preference had little to do with it. We learned to appreciate everything or do without. Waste was not an option. I was raised on whatever meats my father managed to shoot or trap out of the fence row or shelter belt. That meant quail, rabbit, pheasant were what I ate long before beef and chicken. Fresh milk, homemade bread, and whatever the garden produced was the bigger part of our diet. Today, I have learned to eat and like most foods. There are very few things I am adverse to eating or at least trying. I have fed a hundred children and staff members on a moment’s notice when the food company truck failed to arrive. “What are we going to do?” was the question put to me. My response was very simple, “Let’s pray and ask God.” By prayer, asking God to provide, then looking around at the fields and wild edibles available at that season, with the help of the children in harvesting, we spread the table for a memorable feast. Many children learned real faith through that lesson – and the feast of field corn gleanings steamed over the coals of a campfire and windfall apples cooked in aluminum foil to make applesauce will not be forgotten for a long time. It wasn’t on the menu, and it wasn’t what anyone thought of, but it was delicious, nutritious, and healthful. God’s answer came to bless us using faith, human observation, and a willingness to do the work of harvesting and gleaning. We were thankful for our foods, unable to complain, or comment on preferences. I’m curious how Farmer John turns tires inside out to make planters for the rhubarb. FJ, do you use pure compost or a mixture of manure, soil and whatever? When planting it, how many years must you count on from planting to picking? I’m thinking the more permanently producing plants (rhubarb, asparagus, berries, horseradish, etc) you have in place and producing, the better for your personal culinary economics! Turning tires inside out is somewhat considered a “trade secret” and can be hard to explain without seeing it done. Even the tire shops don’t know how to do it. It takes a special custom made blade (farmer customized wood blade 10-12 teeth per inch) and a jig saw with a “narrow” foot. Cut out both sidewalls, then you get the tire to turn by stepping down on one side, pulling up the tire, twisting it over – with some special footwork – again you need to see it done. I get so many requests about the “how-to” that I guess I need to do another demo and have a tire turning party. The local vo-tech college will probably set me up with another class on homesteading skills like this in the fall. Just did another 7 tires today for a lady’s rhubarb patch. We make all kinds of things out of tires turned inside out – planters, horse swings, tire swings, salt feeders, garden fountains, and more. We add about 1/3 soil, 1/3 compost (if we have enough), and 1/3 peat moss. Divide the crowns with a shovel and transplant in early spring when the the first leaves break the ground. You don’t harvest any rhubarb the first year, and only sparingly the second. By the third year it’s going great. Clean out the chicken coop in the fall and top dress after the plants have died back after a freeze. The bedding/manure mix is the secret to great early spring rhubarb. You can include mints in that perennial list as well. Yes, indeed, the culinary economics depend on perennials. P.S. Thanks for explaining your rhubarb growing secrets! I want in on one of those tire turning demos! I love Rhubarb!!! I know, it grew in my grandpa’s garden, my dad took over caring for it when Grandpa couldn’t anymore, and my brother just went to Grandpa’s old house and picked a bunch… Ahhh, he made some rhubarb strawberry pastry for his wife, and I am dying over how good it looks. My sister-in-law just posted the recipe my brother made for her on her blog, check it out! http://lynettesnewhobby.blogspot.com/2009/06/strawberry-rhubarb-pastry.html Although it is similar to what my mom used to make, there are a few differences. I can’t wait to try it out. Now that I live in a city, with no dirt of my own…I cry…except for the tomatoes, zucchini, squash and peas I have growing in pots on my balcony…anyone know if rhubarb will grow in pots? Yes, I think I am one of those rare people that love to sink my teeth into raw rhubarb…I love the tart, lip puckering, but delicious taste. I’m very impressed that you are growing sooo much on your balcony! You are a farmgirl at heart! Thanks for commenting here!